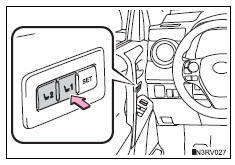 Your preferred driving position (the position of the driver’s seat) can be recorded and recalled by pressing a button. Adjust the driver’s seat to the desired positions. While pressing the “set” button, press button “1” or “2” until the buzzer sounds. Press button “1” or “2”. Operate any of the seat adjustment switches. 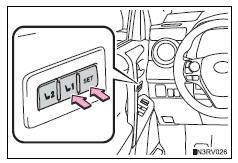 Recorded seat positions can be activated up to 180 seconds after the driver’s door is opened and another 60 seconds after it is closed again. The memorized positions are erased.